Most Price Pfister bathroom faucets are just like any other bathroom faucet. Price Pfister uses a putty plate between the faucet and the sink. This helps to prevent the seal from breaking when making adjustments to the faucet. Taking apart a Price Pfister faucet includes removing the faucet from the sink, removing the handles and removing the cartridges. The spout of the Price Pfister is molded into the base of the faucet. Go under the sink and turn off the two water valves to shut the water off to the faucet. Turn both faucet handles on to drain any remaining water in the line. 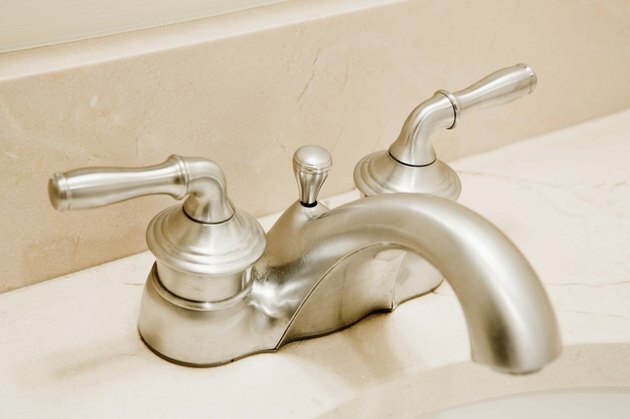 Turn the faucets handles off, and locate the water supply line connections to the faucet handles under the sink. Turn the water supply connections at the faucet handles counterclockwise with a wrench until you can turn them by hand. Finish removing the water supply lines by hand and push the ends of the lines out of the way. Turn the plastic thumb nuts counterclockwise with your fingers. The thumb nuts secure the faucet handle stems to the sink. Pull the faucet off the sink basin. Insert a putty knife between the bottom of the putty plate and the sink. Gently pry the plate away from the sink, and scrape away any residual putty off the sink with the putty knife. Pry off the decorative button cover on the top of each faucet handle with a flat-head screwdriver. Remove the center securing screw in the handle with a Phillips-head screwdriver. Turn the handle base counterclockwise with your fingers. Lift the handle off of the faucet cartridge. Pull the faucet handles off the Price Pfister faucet. Rotate the cartridge retaining nut counterclockwise with a pair of slip joint pliers. Pull the cartridge straight out of the faucet body.